If you feel like the rate of change in business is accelerating like a rocket ship, you're right. In fact, it has been estimated that more information has been produced in the last 30 years than was produced in the previous 5,000. Changing technology, consumer preferences, regulations, and competitive landscapes make it necessary for today’s employees to gain new knowledge, skills, and outlooks more rapidly than ever before. This means that business leaders who are successful at creating and supporting a culture of continuous learning have an advantage, as their employees have ever increasingly widened perspectives that are used to approach problem solving. On an individual level, continuous learning means a constant pursuit of knowledge. This information helps individuals do their jobs better and solve problems more creatively, so a lot of companies invest in training, online tutorials, or discretionary time for employees to spend learning something new. Sometimes, employers encourage people to do things like learn a new software program or process improvement approach. Other times, they promote out-of-the-box employee engagement activities like learning a new language or instrument. This type of learning - regardless of the subject - stimulates the mind and encourages employees to approach their work with a broader perspective. When one person learns something in a continuous learning organization, their information is added to the existing knowledge bank, so that everyone else can benefit from that information. Continuous learning on the group level increases organizational efficiency as new best practices are disseminated and everyone is not constantly reinventing the wheel. Both types of continuous learning - both individual and group - are important for maintaining a culture of continuous improvement. The widened perspective that comes from learning new things solo and from the experience of a group promotes the identification of opportunities for improvement, as well as creative problem solving. The more people that are engaged in continuous learning the better, as each addition to the culture brings a fresh perspective to the communal knowledge bank. Communication is a critical component for learning that benefits the organization as a whole. Companies that provide support and encouragement for communication between all parts and levels of the organization are able to benefit from collective wisdom and more quickly identify gaps in knowledge or skills. A continuous learning organization promotes a culture of openness in which people feel safe in speaking up to share their problems and ideas, and learn from one another as a result. Having less-experienced employees collaborate with subject matter experts in cross functional collaboration is a great learning opportunity for both. The expert potentially gains a new prospective and novel ideas, while the novice has the opportunity to observe and ask questions. Getting people together from different shifts, locations, and functions is a great way to promote continuous learning, as each individual will have something unique to bring to the table. Continuous learning doesn’t mean continuously learning the same thing over and over again across the organization. In order to build on knowledge, successful organizations document what they already have learned so that people can pull from that information in the future. Capturing the details about past improvement activities, for example, helps teams internalize that experience, repeat what works, and repair what doesn’t. Learning requires effort and a certain degree of emotional investment. Employees who are engaged and feel connected to the organization are far more likely to accept the challenge of trying something new. There are lots of things you can do to increase employee engagement, including asking for their ideas for improvement and empowering them to make daily continuous improvements. Check out this free eBook for more ideas. Learning often involves a process of trial and error. Feedback from supervisors and executives is essential for amplifying the activities and behaviors that are leading to positive change and minimizing those that are not. The key here is to make sure that the feedback is constructive; in order to keep your employees engaged in continuous learning and applying what they and others have learned, they must first feel safe in failing. Only when they know it’s alright to try and fail will they commit to striving for greatness. Not all learning includes formal classroom training. In fact, only 5 to 15% of what we learn at work comes from formal training. Most of us learn more from the break room than the classroom. Successful learning organizations realize this and make an effort to improve the opportunities for employees to learn by doing, observing and talking to each other. 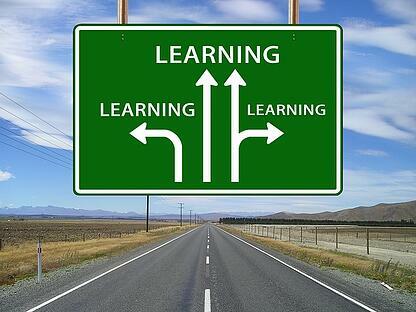 Continuous learning is essential for modern businesses. By replicating some of the habits of successful organizations, you can improve performance and build a better future for your business and your employees.